Brett McGillivray, "Geography of British Columbia: People and Landscapes in Transition"
Why is British Columbia unique within Canada? What physical processes have made this province so rugged and produced such remarkable variation in climate and vegetation? Why did non-Natives come to British Columbia, and what impact did they have on First Nations? Why did so many Asian immigrants come to this province and then leave for other parts of Canada? How were resources developed in the past and how are those resources developed today? 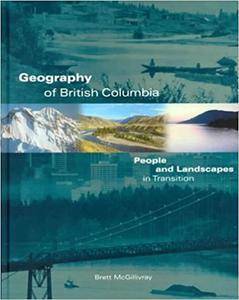 Geography of British Columbia discusses these and many other aspects of the growth of this distinctive province. Brett McGillivray focuses first on the combination of physical processes that produced a spectacular variety of mountains, rivers, lakes, islands, fjords, forests, and minerals, explaining the forces that created the province and the natural hazards that can reshape it. A concise examination of B.C. historical geography follows, covering First Nations ways of life, colonization, Asian immigration, and the sad history of institutionalized racism. The second half of the book contains a detailed description of the economic geography of the province, with chapters on forestry, the salmon fishery, metal mining, energy supply and demand, agriculture, water, and the tourism industry. It addresses the present-day issues of urbanization, economic development, and resource management, providing a thorough background to these topics and suggesting what the future might hold. This up-to-date and comprehensive exploration of the rich historical geography and development of British Columbia will be welcomed by teachers, students, scholars, and everyone with an interest in the province.